I am talking about my new sock, in Shibui, colour wasabi. I have been slowly plodding along, miscounting and ripping back. So last night I tried it on! OOPs it doesn’t fit. I need a crowbar and some slippery lotion. I did manage to get it over my heel but what a workout for my hands, I won’t be doing that again. 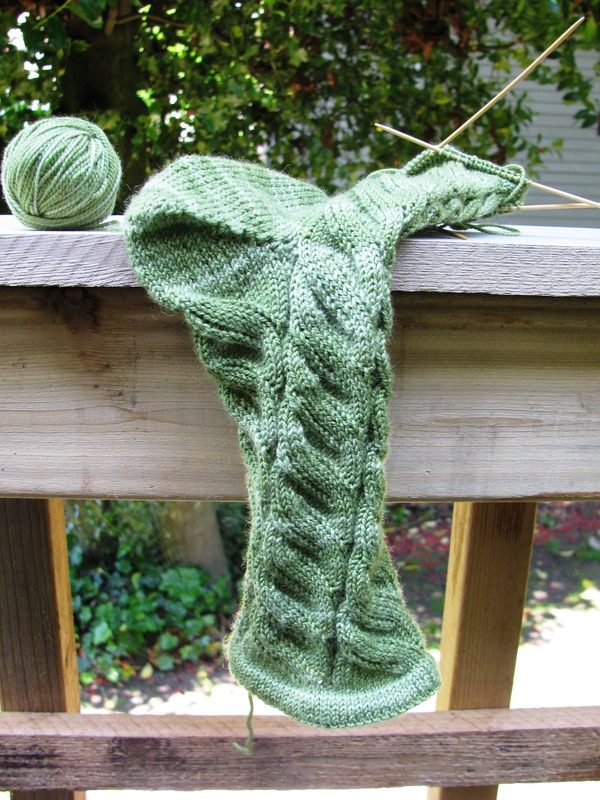 I always use size 2mm needles, otherwise the socks just swim on my feet and I was worried about the cuff coming down. I managed to ignore the fact that that cuff or band would not stretch. I should have listened to the little voice. The sock is a little greyed down,it has a yellowish tinge, in this photo. The pattern is nutkin and I was doing this for project spectrum 5. 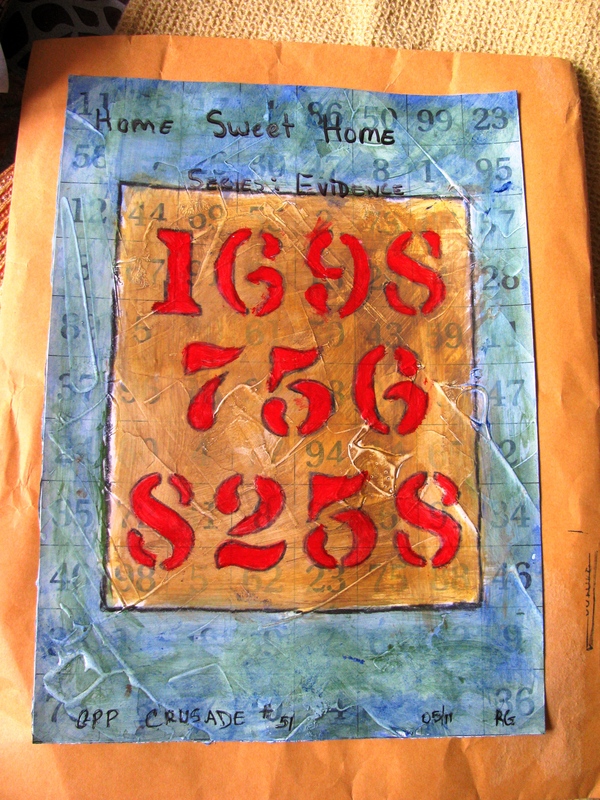 Michelle Ward continues with her latest series of crusades with evidence of our houses, called Home Sweet Home. I decided to tie it in with project spectrum as well, so I did use the red for May. I decided to work with house numbers, I have quite often kept records of colour schemes, room demensions, garden layouts etc but house numbers seemed the way to go, especially after I found the paper with numbers on it. So I just included numbers of the houses we owned. After cutting the paper to fit the envelope again, I scraped on a coat of gesso and then got out a stensil. I used an old marker to do the outlines, then red and black crayons to fill in and outline the numbers. I painted in the backgrouns with some craft paint. Then added some dull gold over the yellow, added some blue textile paint over the peridot. The red was looking a little dull, so went over it again with some red fluid acrylic. That made it pop. I think it needs something else, I just added the details of the crusade challenge to the page. Once again it was fun to join other artists online. So thanks, Michelle, for putting this out there for us. I haven’t read the posts from other artists, for the last 2 crusades, so I’ll be visiting the other artists and leaving comments. I can’t wait to see what they have done. Project Spectrum is underway again, and we will be working with a different colour each month. Although, it was started by a knitter, Lauren, it can encompass all aspects. So you can read about the colour and how it is made, or it might feature the colour in a title. Think food, flowers, clothes anything that takes your fancy, then write a post, take photo and put it on flicker. I think this is the third or fourth year that I have played along. So thanks to Lauren for organizing it once again. I have been knitting, a another pair of socks. I was happily working away, when I realized that I was working with the wrong colour for May. The colour was red, what was I doing with a yarn called Green Envy? Other than loving it, of course! 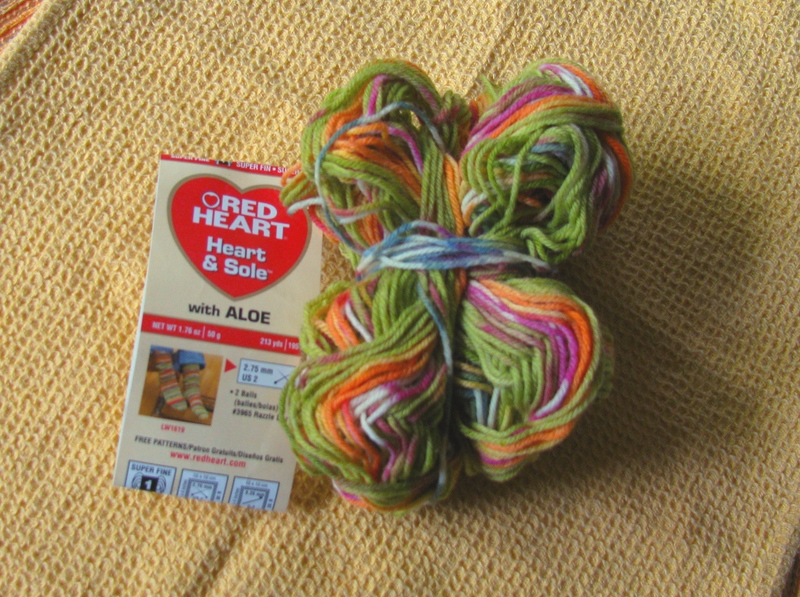 It was a Red Heart yarn called Heart and Sole, Razzle Dazzle. literally, saved by the label. The usual 2mm, 64 stitches but this time the gusset decreases are along the sole. I was still playing with a mixed up rib pattern. I wore them today, I love the way they feel. That’s pair number 5 for this year.